I know, I know. You don’t want to be one of THOSE people. The person on the block who everyone thinks is crazy because they have a nuclear bunker in their basement full of wheat and their backyard is fenced with 50 gallon barrels full of water. And I definitely don’t think it is a good thing to be extreme and consumed when it comes to emergency preparedness. But, let’s look at it like we do car insurance for a minute, can we? Every month you pay a premium to ensure that if the worst case scenario happens, you will be prepared to handle it financially. And then every day you get in your car and drive where you need to go without freaking out at every turn that you are going to be in an accident. This is not crazy. It is wise. And preparing for emergency situations is no different. Taking the time to consider what the worst case scenarios might be in your life and doing what you can to prepare for them mentally and temporally is not crazy– it is wise. And it will make all the difference in the world if an emergency or disaster situation arises in your life. All those people who mocked you for preparing will be the ones running around crazy and distraught, and you will be the cool-headed one with a plan. In America, we have experienced a long period of prosperity. Many of us have not gone through a natural disaster, though many have occurred. Sometimes it is hard to imagine that anything bad will ever happen here. But, history would tell us that way of thinking is a little foolish. And current events make it harder and harder to deny that their may be some difficult days ahead of us. 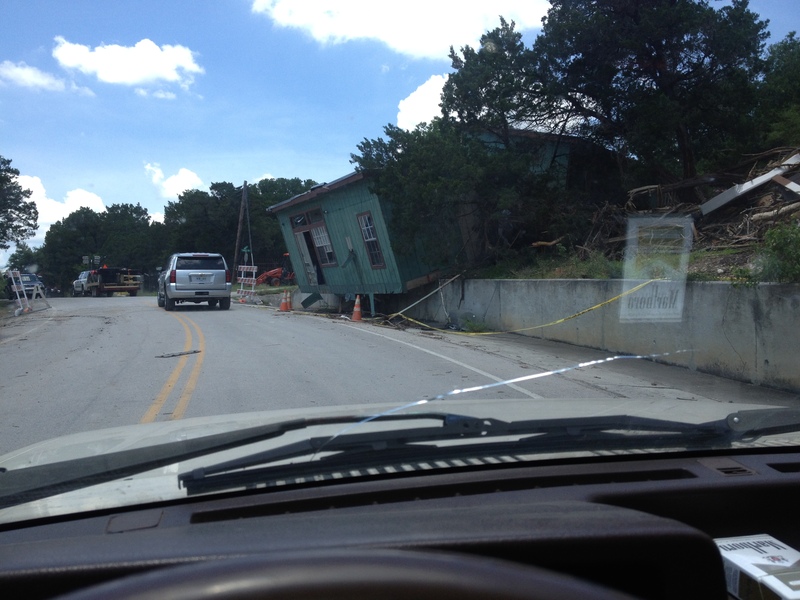 Last month my husband went to Wimberley, TX- a small town outside of Houston, to help with the flood relief efforts. Enough water fell on Texas in the month of May to cover the entire state with 8 inches of water. We are talking 37.3 trillion gallons of water. I don’t think Texas saw that coming. 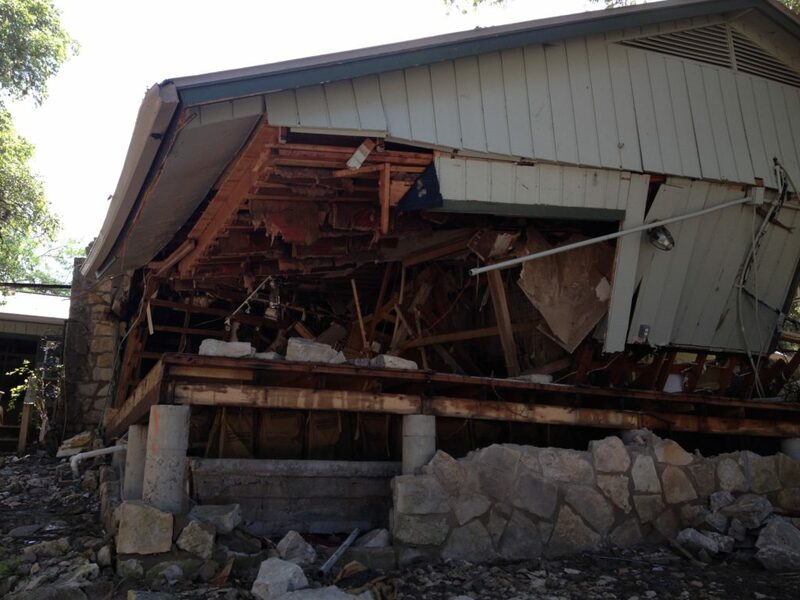 I know in the small town of Wimberly that was devastated by the storm, nobody saw it coming. A river that normally ran 55 feet below houses rose above their rooftops. Of the 2900 homes in the area, around 1100 were effected, most of them critically, by the flood. Some 300 of the homes were washed away entirely. Making matters worse, the river rose in the middle of the night. One couple woke up to the water rising, reached over to get their car keys and found they were no longer on the nightstand because the water was now covering the nightstand. They walked outside just in time to see their truck floating away. 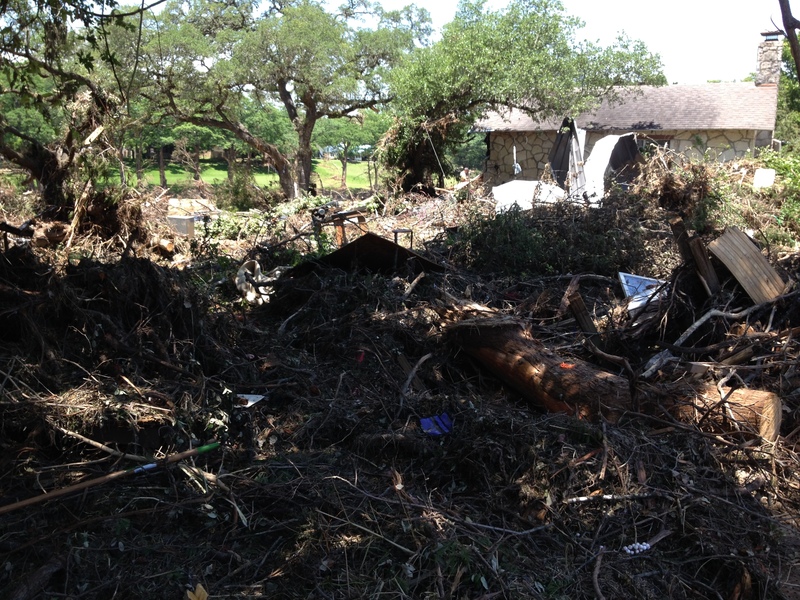 Eleven people lost their lives in Wimberley alone. No one had flood insurance. Many lost everything. The aftermath and consequences of this flood will take over their lives for many years as they work to recover and rebuild what was lost. My husband came home humbled and sober. Natural disasters quickly teach us no matter how hard we try to control all the factors in our lives so that we can feel secure, we are not ultimately the ones who are in control. And disasters can strike anyone, anywhere. Tornadoes, hurricanes, floods, fires, earthquakes, even tsunamis, are a regular part of our news cycle. But, most of us sit home, feeling sorry for the ones affected, assuming it will never happen where we live. 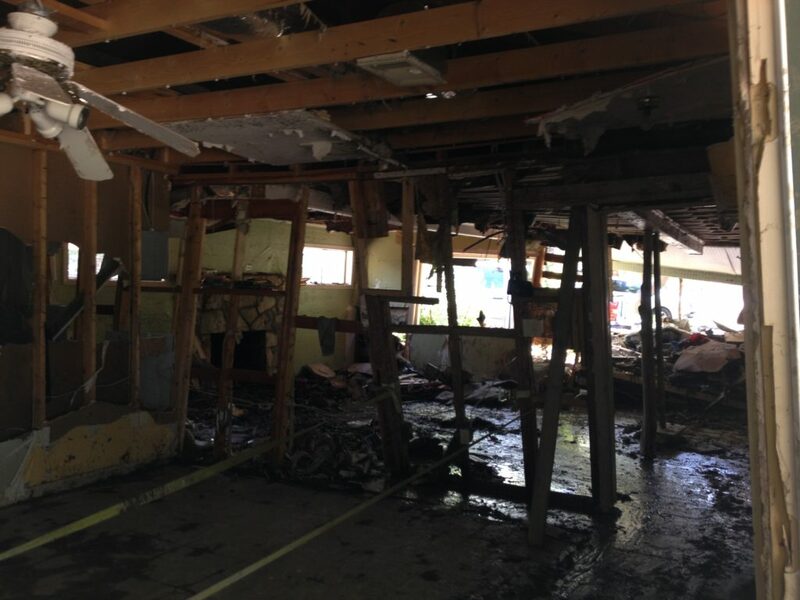 Beyond natural disasters, we have witnessed recent pop-ups of civil unrest in Baltimore and Ferguson. We have seen an Ebola outbreak. The Avian Flu has led to egg rationing in America as of June 5th. This past weekend, an economic crisis in Greece led to a rush on the banks there. The economies of the world are so intertwined now, it is difficult to contain trouble from spreading from one region to another. I point these examples out not to fill you with fear, but to hopefully help you accept the fact that it is possible that something outside of your comfort zone could happen to you. Survivors are generally the ones that have accepted hard things could happen to them and have mentally prepared for that possibility. If you have prepared for it mentally, physically, and temporally, you will have less fear and more ability to help others if the situation arises. I would encourage you to consider what your plan B will be in a number of different scenarios that could potentially happen in your life. Then, I would encourage you to prepare for those scenarios as best you can. Once you have prepared, you can live your plan A as if nothing bad will ever happen, knowing that if it does, you have done what you can to prepare and you will face those circumstances with courage. My biggest concern is that so many people will be blind-sided by a disaster that we will have a bunch of scared, selfish, monsters running about when their basic needs are threatened. In each natural disaster, we’ve seen the monsters and the helpers emerge. We need more helpers. We need angels. People who are prepared. People who will help those around them and bring hope, peace, sensibility, and compassion to a stressful situation. Even if you do not have the means to do a whole lot to prepare temporally, just preparing mentally and even spiritually for hard times will be a great advantage to you if the unthinkable happens. This is the most important “why” behind emergency preparedness. So, how do you prepare? Consider the area you live in and the most likely disasters that could occur there. Start preparing for those scenarios first. Play out the scenario in your mind and how you will react. Pray for guidance in what God knows you need to be ready for. Determine to be the one reaching out to others instead of the one looting the nearest store. Next, prepare temporally to whatever extent you can. 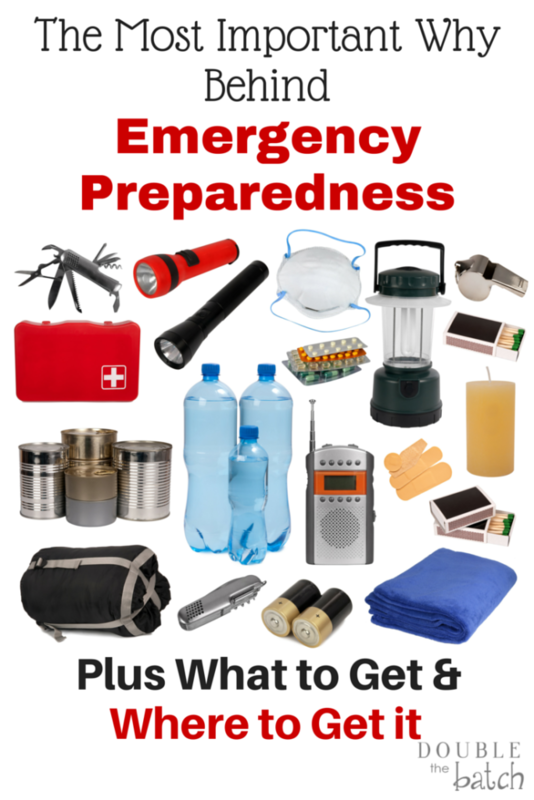 I have listed below several things you can acquire to help you be more prepared and outlined what scenarios each item would be most helpful for. This is by no means an exhaustive list, but it’s a good start. If you don’t have the means to purchase everything you think you need, you are in the same boat as most of us. Purchase what you can over time and build it up. Don’t go into debt to do it. Debt will be your worst enemy if you are struck by a disaster. If you are a praying person, pray for inspiration to know what will be most important for you to have and pray for the means to get it. If you want to build your own custom kit, thesurvivalmom offers a great comprehensive list of what to pack. If you want one fast and don’t have time to build your own, you can find a high-quality, affordable option here. This is a great food rotation system to help you keep your three month supply organized. There are several companies out there selling freeze dried or dehydrated food. Because of the way they pack their food, and because most of their food is MSG and GMO free with no saturated or hydrogenated oil, I highly recommend Eden Valley Farms for your year supply of food. It will have a longer shelf life and survive temperature changes better than other brands. Check them out. Another thing to consider storing would be protein powder drinks, powdered greens, etc. to help you get the nutrition you might be missing with your freeze dried foods. If you are in a zone where you think the most likely natural disaster would destroy your year’s supply, consider storing it in a location other than your residence where you could access it in the event of an emergency. For toiletries- anything you can get in a reusable version as opposed to the disposable version you normally use- like diapers for instance, would be great to have in your year supply. Water purification system- You can and should store water in water barrels and have filtered water bottles on hand for short term interruptions, but a water purification system of some kind will ensure you will always have drinking water as long as you are near a water source. It will become invaluable to you if the water system becomes contaminated or if you are surviving in outlying areas for a time after a natural disaster. I you want a serious system that can do 150 gallons of water per hour, but is still small enough to store under your sink, check out this one. Medication, medicine, nutritional supplements– This is a tough one. For those whose lives are dependent on medication, the thought of a breakdown in the system that could prevent them from getting medication is terrifying. Talk with your doctor about the possibility and see if there is anything that can be done to have a supply on hand for these circumstances. Over the counter medicines are much easier to get and to store as there is no restriction on how much you can buy. Nutritional supplements can be a great benefit to you and your family when fresh foods are hard to come by. Do some research and choose a supplement that won’t just go right through you. One that will actually be absorbed by your body. Stool softeners and laxatives will also come in handy as your body may have trouble adjusting to your new freeze-dried diet. An all-weather, heavy-duty tent- Shelter is critical if your home becomes uninhabitable or if you choose to move to outlying areas because of civil unrest or destruction in your area. A heavy duty tent can provide temporary shelter until you can move to something more permanent. The Kodiak Canvas Flex-Bow is a fantastic option if you are looking for something easy to set up, but durable and well-designed. Read the reviews and you will be impressed. It comes in various sizes and is your best bet if you aren’t ready to move to a full-on, military-grade tent. Just remember it is canvas and should never be put away wet or you will destroy your investment. Take care of it and it will serve you well for a long time. Clothes and gear for every season/boots and shoes for every season- If you end up living in outlying areas for a time, having the right clothing to handle extreme temperatures when you no longer have a thermostat to adjust to your comfort level will be important. Having it all in one place, easily accessible is also important. Light sources/Fire starting materials– Flashlights and headlamps are great. Solar lights are another key component, as they will never run out of battery power. Fires will be critical for heat and cooking purposes, so make sure you have supplies to help you start a fire. The Gerber Bear Grylls Fire Starter Kit is a great tool for when your matches or lighters run out. All-weather bedding/cots or sleeping pads- I don’t know about you, but I HATE to be cold. Sleeping bags to keep you warm outside during winter months will be one of the best investments you can make. This one is built to keep you warm at -35 degrees. Or if you want a lighter weight/mummy bag option, check out this one rated at -20. A cot, unlike and air mattress, will not go flat on you. And that’s a real nice feature. 🙂 Here is one good option. But, you have to check out this double bunk system I found while I was researching that can transform into a bench during the day! Pretty cool. Sunscreen, bug spray, lotion, lip balm– These are items we take for granted until they are gone. They can make life a lot easier if you are living out in the weather for a time. Emergency radios and communication devices- Sadly, our cell service is often the first thing to go in a disaster zone. At some point. radios could be the only link you have to your family and to what is going on in the outside world. Not a bad idea to have on hand. You can find a good two-way radio option here, and here is a good HAM radio option. And here is a solar charging system to keep your cellphone, ipad, and other USB port devices charged when you can’t be near an outlet. Various tools– These will help you recover or dig out after a natural disaster or set up camp in outlying areas after a disaster. This compact shovel is a good place to start. And a Leatherman is always handy. Hammers are must. And a Pipe Wrench would be good to have on hand. An no one is prepared without paracord. You get the idea. Cooking supplies– It would be a little silly to have food, but no way to cook it. One of my favorite camping cooking items is my portable butane stove. This single burner is compact and easy to use. I use it when I am frying things so I can do it outside and not stink up my house. It is fueled by these cans of butane. It would be all you would need to quickly heat water for your freeze dried food as well. A great product. Have a tote with pots, pans, utensils, plates, bowls, knives, etc., ready to go as well. 1-strap your water heater to the wall so that it will not fall over and break your gas line in the event of an earthquake starting a fire. 2– Have all your important documents in easy to grab, easy to find binder so you can take it with you if you need to leave quickly. 3– Have a plan to find out the whereabouts and condition of family members who could get separated during a disaster. Choose an out of state contact for everyone to report to if they can find a means of communication. Choose a location outside of the areas that will be most affected to be your meet up spot. Okay- so now you are probably feeling overwhelmed. So, let me admit to you that as emergency preparedness- minded as my husband and I are, we don’t even have all the things on this list. But, we are working on it over time. And you should as well. Don’t get discouraged and give-up before you even start. Actively doing something is good for you mentally and every little bit you do and acquire counts. Don’t be fearful or discouraged. Just take life one day at a time and do the best you can. Maybe life will always be easy. But, if it isn’t, it’s okay. The hardest moments we face in this life are the ones that bring out the best in us when we face them with courage and faith. Who we truly are is revealed in these moments and I bet you will find out you are a lot stronger than you thought.